it feels so wierd to have nubbie nails after having them long for months! i was given a set of press-ons at blogger dinner i went to... i think now is the perfect time to try them out. i'm thinking they aren't going to last long if i wear them to the barn... my natural nails are having a heck of a time with the abuse! 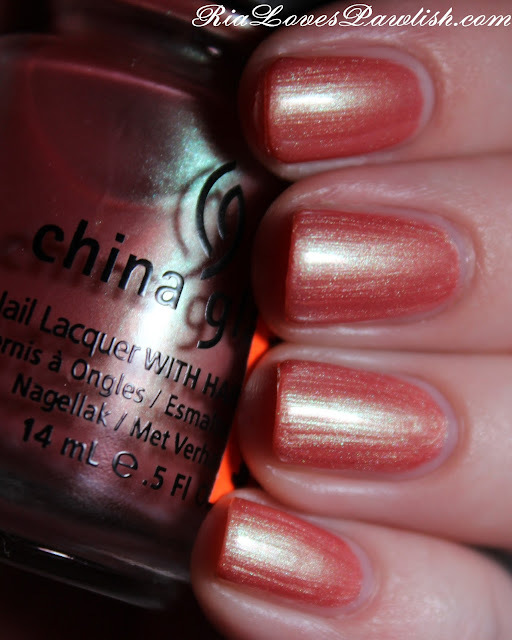 today's polish is China Glaze Chiaroscuro, a gorgeous warm pink pearl with a shimmery green duochrome reflex! a mouthful, but true :) i absolutely adore colors like this, so elegant and beautiful. there are a few brushstrokes, but they aren't too noticeable... and you generally do get brushstrokes with this type of polish. the formula was really easy to work with and only took two coats for full opacity! it dries pretty dull, so it definitely needs a shine topcoat to bring out all it has to offer. two coats Chiaroscuro, one coat Seche Vite.